IEEE 802.15 is a working group of the Institute of Electrical and Electronics Engineers (IEEE) IEEE 802 standards committee which specifies wireless personal area network (WPAN) standards. There are 10 major areas of development, not all of which are active. A working group or working party is a group of experts working together to achieve specified goals. The groups are domain-specific and focus on discussion or activity around a specific subject area. The term can sometimes refer to an interdisciplinary collaboration of researchers working on new activities that would be difficult to sustain under traditional funding mechanisms. The number of Task Groups in IEEE 802.15 varies based on the number of active projects. The current list of active projects can be found on the IEEE 802.15 web site. IEEE 802.15.3-2003 is a MAC and PHY standard for high-rate (11 to 55 Mbit/s) WPANs. The standard can be downloaded via the IEEE Get program,  which is funded by IEEE 802 volunteers. a method for a device to return information about signal quality of a received packet. Audio/visual (AV) mode (OFDM, up to 3.8 Gbit/s). IEEE 802.15.4-2003 (Low Rate WPAN) deals with low data rate but very long battery life (months or even years) and very low complexity. The standard defines both the physical (Layer 1) and data-link (Layer 2) layers of the OSI model. The first edition of the 802.15.4 standard was released in May 2003. Several standardized and proprietary networks (or mesh) layer protocols run over 802.15.4-based networks, including IEEE 802.15.5, ZigBee, Thread, 6LoWPAN, WirelessHART, and ISA100.11a. IEEE 802.15.4b was approved in June 2006 and was published in September 2006 as IEEE 802.15.4-2006. 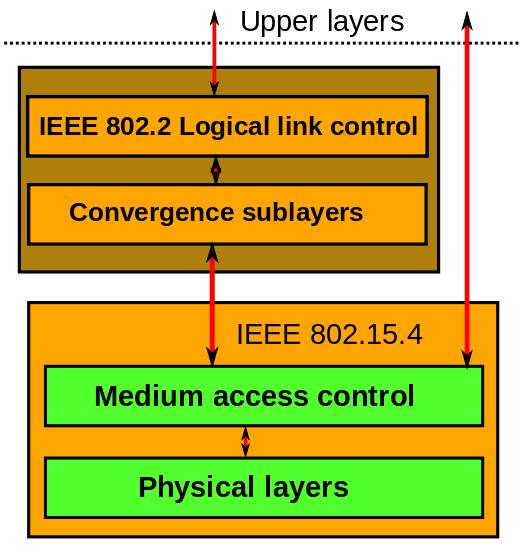 The IEEE 802.15 task group 4b was chartered to create a project for specific enhancements and clarifications to the IEEE 802.15.4-2003 standard, such as resolving ambiguities, reducing unnecessary complexity, increasing flexibility in security key usage, considerations for newly available frequency allocations, and others. IEEE 802.15.4c was approved in 2008 and was published in January 2009. This defines a PHY amendment adds new rf spectrum specifications to address the Chinese regulatory changes which have opened the 314-316 MHz, 430-434 MHz, and 779-787 MHz bands for Wireless PAN use within China. The IEEE 802.15 Task Group 4d was chartered to define an amendment to the 802.15.4-2006 standard. The amendment defines a new PHY and such changes to the MAC as are necessary to support a new frequency allocation (950 MHz -956 MHz) in Japan while coexisting with passive tag systems in the band. The IEEE 802.15 Task Group 4e is chartered to define a MAC amendment to the existing standard 802.15.4-2006. The intent of this amendment is to enhance and add functionality to the 802.15.4-2006 MAC to a) better support the industrial markets and b) permit compatibility with modifications being proposed within the Chinese WPAN. Specific enhancements were made to add channel hopping and a variable time slot option compatible with ISA100.11a. These changes were approved in 2011. The IEEE 802.15.4f Active RFID System Task Group is chartered to define new wireless Physical (PHY) layer(s) and enhancements to the 802.15.4-2006 standard MAC layer which are required to support new PHY(s) for active RFID system bi-directional and location determination applications. IEEE 802.15.5 provides the architectural framework enabling WPAN devices to promote interoperable, stable, and scalable wireless mesh networking. This standard is composed of two parts: low-rate WPAN mesh and high-rate WPAN mesh networks. The low-rate mesh is built on IEEE 802.15.4-2006 MAC, while the high rate mesh utilizes IEEE 802.15.3/3b MAC. The common features of both meshes include network initialization, addressing, and multihop unicasting. In addition, the low-rate mesh supports multicasting, reliable broadcasting, portability support, trace route and energy saving function, and the high rate mesh supports multihop time-guaranteed service. In December 2011, the IEEE 802.15.6 task group approved a draft of a standard for Body Area Network (BAN) technologies. The draft was approved on 22 July 2011 by Letter Ballot to start the Sponsor Ballot process. Task Group 6 was formed in November 2007 to focus on a low-power and short-range wireless standard to be optimized for devices and operation on, in, or around the human body (but not limited to humans) to serve a variety of applications including medical, consumer electronics, and personal entertainment. The draft standard is under development, more information can be found on the IEEE 802.15 Task Group 8 web page. While IEEE Std 802.15.4 has always supported datagram security, it has not provided a mechanism for establishing the keys used by this feature. Lack of key management support in IEEE Std 802.15.4 can result in weak keys, which is a common avenue for attacking the security system. Adding KMP support is critical to a proper security framework. Some of the existing KMPs that it may address are IETF's PANA, HIP, IKEv2, IEEE Std 802.1X, and 4-Way-Handshake. The draft recommended practice is under development, more information can be found on the IEEE 802.15 web page. The draft recommended practice is under development; more information can be found on the IEEE 802.15.10 web page. IEEE 802.3 is a working group and a collection of Institute of Electrical and Electronics Engineers (IEEE) standards produced by the working group defining the physical layer and data link layer's media access control (MAC) of wired Ethernet. This is generally a local area network (LAN) technology with some wide area network (WAN) applications. Physical connections are made between nodes and/or infrastructure devices by various types of copper or fiber cable. Zigbee is an IEEE 802.15.4-based specification for a suite of high-level communication protocols used to create personal area networks with small, low-power digital radios, such as for home automation, medical device data collection, and other low-power low-bandwidth needs, designed for small scale projects which need wireless connection. Hence, Zigbee is a low-power, low data rate, and close proximity wireless ad hoc network. IEEE 802.15.4 is a technical standard which defines the operation of low-rate wireless personal area networks (LR-WPANs). It specifies the physical layer and media access control for LR-WPANs, and is maintained by the IEEE 802.15 working group, which defined the standard in 2003. It is the basis for the Zigbee, ISA100.11a, WirelessHART, MiWi, 6LoWPAN, Thread and SNAP specifications, each of which further extends the standard by developing the upper layers which are not defined in IEEE 802.15.4. In particular, 6LoWPAN defines a binding for the IPv6 version of the Internet Protocol (IP) over WPANs, and is itself used by upper layers like Thread. 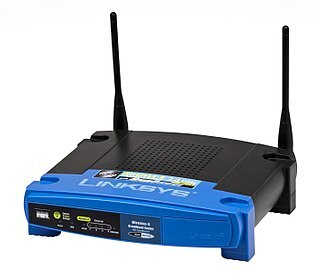 In IEEE 802.11 wireless local area networking standards, a service set is a group of wireless network devices that are operating with the same networking parameters. The WiMedia Alliance was a non-profit industry trade group that promoted the adoption, regulation, standardization and multi-vendor interoperability of ultra-wideband (UWB) technologies. It existed from about 2002 through 2009. 6LoWPAN is an acronym of IPv6 over Low-Power Wireless Personal Area Networks. 6LoWPAN is the name of a concluded working group in the Internet area of the IETF. FM-UWB is a modulation scheme using double FM: low-modulation index digital FSK followed by high-modulation index analog FM to create a constant envelope UWB signal. FDMA techniques at the subcarrier level may be exploited to accommodate multiple users. The system is intended for low and medium bit rate, and short-range WPAN systems. The technology, developed at CSEM, is paving the way for true low-power LDR-UWB communication devices. FM-UWB is an optional mode in the IEEE802.15.6 Body Area Network (BAN) standard. In digital communications, chirp spread spectrum (CSS) is a spread spectrum technique that uses wideband linear frequency modulated chirp pulses to encode information. A chirp is a sinusoidal signal of frequency increase or decrease over time. In the picture is an example of an upchirp in which the frequency increases linearly over time. Sometimes the frequency of upchirps increase exponentially over time. IEEE 802.19 is the Wireless Coexistence Technical Advisory Group (TAG) within the IEEE 802 LAN/MAN Standards Committee. The TAG deals with coexistence between unlicensed wireless networks. Many of the IEEE 802 wireless standards use unlicensed spectrum and hence need to address the issue of coexistence. These unlicensed wireless devices may operate in the same unlicensed frequency band in the same location. This can lead to interference between these two wireless networks. IEEE 802.15.4a was an amendment to IEEE 802.15.4-2006 specifying that additional physical layers (PHYs) be added to the original standard. It has been merged into and is superseded by IEEE 802.15.4-2011. IEEE 802.11ad is an amendment to the IEEE 802.11 wireless networking standard, developed to provide a Multiple Gigabit Wireless System (MGWS) standard at 60 GHz frequency, and is a networking standard for WiGig networks. Because it uses the V band of millimeter wave (mmW) frequency, the range of IEEE 802.11ad communication would be rather limited compared to other conventional Wi-Fi systems. However, the high frequency allows it to use more bandwidth which in turn enables the transmission of data at high data rates up to multiple gigabits per second, enabling usage scenarios like transmission of uncompressed UHD video over the wireless network. Nivis, LLC is a company that designs and manufactures wireless sensor networks for smart grid and industrial process automation. Target applications include process monitoring, environmental monitoring, power management, security, and the internet of things. The company is headquartered in Atlanta, Georgia, with additional offices in Romania, where much of its technology is developed. The company’s product portfolio consists of standards-based wireless communications systems, including radio nodes, routers, management software and a software stack for native communications. Nivis hardware is operated by open source software. ↑ "IEEE Std 802.15.1-2005 – Part 15.1: Wireless Medium Access Control (MAC) and Physical Layer (PHY) Specifications for Wireless Personal Area Networks (WPANs)". IEEE Standards Association. doi:10.1109/IEEESTD.2005.96290. ISBN 0-7381-4707-9 . Retrieved June 30, 2011. ↑ "IEEE IEEE 802.15 WPAN Task Group 1 (TG1)". official web site. IEEE Standards Association. February 9, 2004. Retrieved June 30, 2011. ↑ "IEEE Std 802.15.2-2003 – Part 15.2: Coexistence of Wireless Personal Area Networks with Other Wireless Devices Operating in Unlicensed Frequency Bands". IEEE Standards Association. 2003. doi:10.1109/IEEESTD.2003.94386. ISBN 0-7381-3703-0 . Retrieved June 30, 2011. ↑ "IEEE 802.15 WPAN Task Group 2 (TG2)". official web site. IEEE Standards Association. May 12, 2004. Retrieved June 30, 2011. ↑ "IEEE Standards Association - Documents". mentor.ieee.org. Retrieved 12 April 2018. ↑ "IEEE 802.15 WPAN Low Rate Alternative PHY Task Group 4a (TG4a)". IEEE Standards Association. 30 Mar 2007. Retrieved 9 Dec 2011. .
↑ "Elster, Itron, Landis+Gyr, NICT and Silver Spring Networks Drive Adoption of IEEE 802.15.4g". Press release. 7 May 2012. Retrieved 16 November 2013. ↑ "TR-51 Smart Utility Networks". Committee web site. TIA. Retrieved 16 November 2013. ↑ "IEEE 802.15 WPAN Task Group 6 (TG6) Body Area Networks". IEEE Standards Association. 9 Jun 2011. Retrieved 9 Dec 2011. ↑ "IEEE 802.15 WPAN Task Group 7 (TG7) Visible Light Communication". IEEE Standards Association. April 9, 2011. Retrieved 9 Dec 2011. ↑ "IEEE 802.15.9 Project Authorization Request (PAR)" (PDF). IEEE Standards Association. 3 Sep 2015. Retrieved 25 Sep 2015. .
↑ "IEEE 802.15 .10 Project Authorization Request (PAR)" (PDF). 23 Aug 2013. Retrieved 24 Sep 2015. ↑ "IEEE 802.15 WPAN SCwng Wireless Next Generation Standing Committee". Nov 2011. Retrieved 9 Dec 2011.